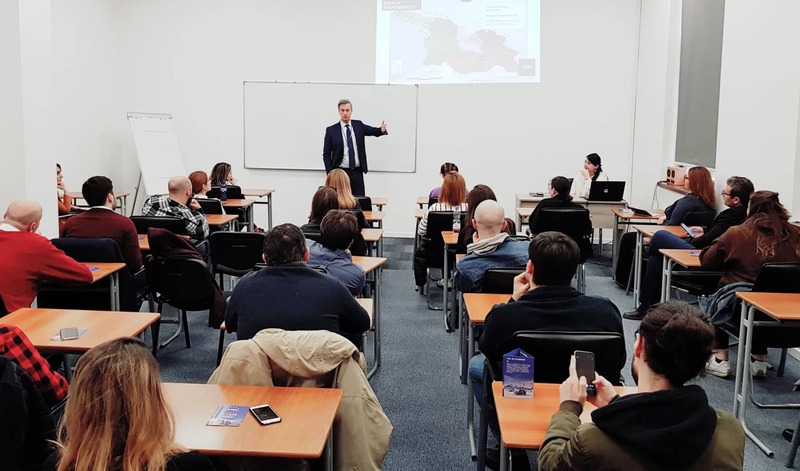 On 14 March, the Head of the EU Monitoring Mission (EUMM) Mr. Erik Høeg, visited Caucasus University in Tbilisi and delivered a public lecture on the Mission’s 10 years of continued presence in Georgia, its achievements and current challenges. Students from Master and Bachelor programmes and academic staff of Caucasus University, attended the presentation. Head of the EUMM provided a short overview of the EU’s Common Security and Defense Policy (CSDP), paying particular attention to the nature of military and civilian missions operating under CSDP. Mr. Høeg talked about the Six-Point Agreement brokered by the European Union and noted the challenges of its implementation. Head of Mission highlighted the role of the Incident Prevention and Response Mechanism (IPRM) meetings in Ergneti and Gali. The Hotline was noted as one of the most successful mechanisms facilitated by the Mission, which helps to ensure communication between the conflict parties. The lecture was followed by a Q&A session, where students showed interest in the challenges of the EUMM in carrying out its mandate. The EUMM, as a part of its new communication strategy, holds public lectures which aim at informing the audience about the Mission mandate and its activities on the ground. The cycle of the public lectures continues and involves other high level educational institutions throughout Georgia.